The WTA Season is finally over. Victoria Azarenka is No. 1. Serena won the WTA Championships. Nadia Petrova won Sofia. The Czechs won Fed Cup. Now it’s time to rest and make party. But before we do let’s look back at 10 things you might have already forgotten about this fabulous WTA Season. 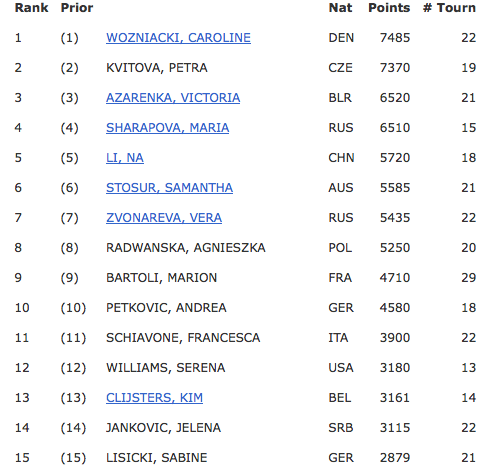 Also: Kerber was ranked No. 32, meaning Cetkovska (No. 31), Niculescu (No. 30), Medina Garrigues (No. 27), and Pavlychenkova (No. 16) were all ranked higher than her. Errani was ranked No. 45, meaning McHale (No. 43), Zakapolova (No. 41), and Begu (No. 40) were all ranked higher. The ASB Classic in Auckland produced one of the best Viral videos of the year just a couple of weeks into 2012. I will never look at Jay-Z the same. 3. 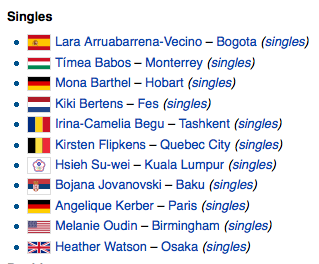 Melanie Oudin won a title. Yes, I know, it feels like a lifetime ago. Or like it never happened. But it did! Before Wimbledon, Melanie Oudin was a Wildcard who won Birmingham, defeating Jelena Jankovic in the final. “It was like this came out of nowhere,” she said afterwards. We completely agree. Oudin is just 3-6 in main-draw WTA play since. 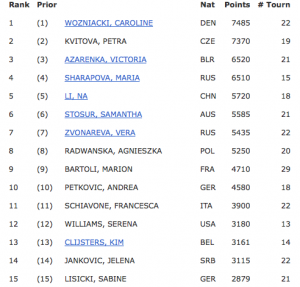 Shvedova started the year ranked No. 208, and finished it ranked No. 25. And while she shot up the rankings, she made history by producing a Golden Set. A GOLDEN SET. We need to talk about this more. 5. That amazing/crazy Li Na-Sharapova final in Rome. Before the French Open and the Career Slam, there was Rome. And it was madness. Rain delays. Match points squandered. Match points saved. Finally, after 2 hours and fifty-two minutes of play, Sharapova walked away with the title. It was all pretty awesome. I must admit that I really didn’t know anything about Chan before her insane match against Jankovic in Carlsbad. But after this quote, I must say I am a huge fan. 7. Paszek d. Wozniacki at Wimbledon. It was just the first round of Wimbledon, but it felt pretty revolutionary. Tamira Paszek, just off her Eastbourne win, was simply fearless, and Caroline Wozniacki showed a much more aggressive all-court game than usual. In a tournament that was marred by the resurfacing of the equal prize money debate, it was wonderful to see two girls steal the spotlight. 8. Mona Barthel was a thing for a while. Seem like it was forever ago? There’s a reason for that. Barthel went 37-24 in 2012, but 27 of those wins came before May! Okay, I know this just happened, and you probably haven’t forgotten about it yet, but I just wanted to be sure. Thanks for a great year, WTA! Can’t wait until 2013. Feel free to sound off in the comments: what were some of your favorite WTA 2012 memories? Lindsay is an author, a filmmaker, a long-winded blogger, and a huge tennis fan. OMG- I just googled that and I cannot believe I haven’t seen that before!! That is amazing. Thanks for the suggestion Perfect Tommy! Really funny post, Linz! Loved it. – Coco Vanderweghe made a Premier Level Final! These are all so great Mario, thanks so much for sharing!! I am especially in love with that Pavs video…she is so special! Copyright © 2019 The Changeover.